Wow! We can’t believe it is October already! Things have been so busy! 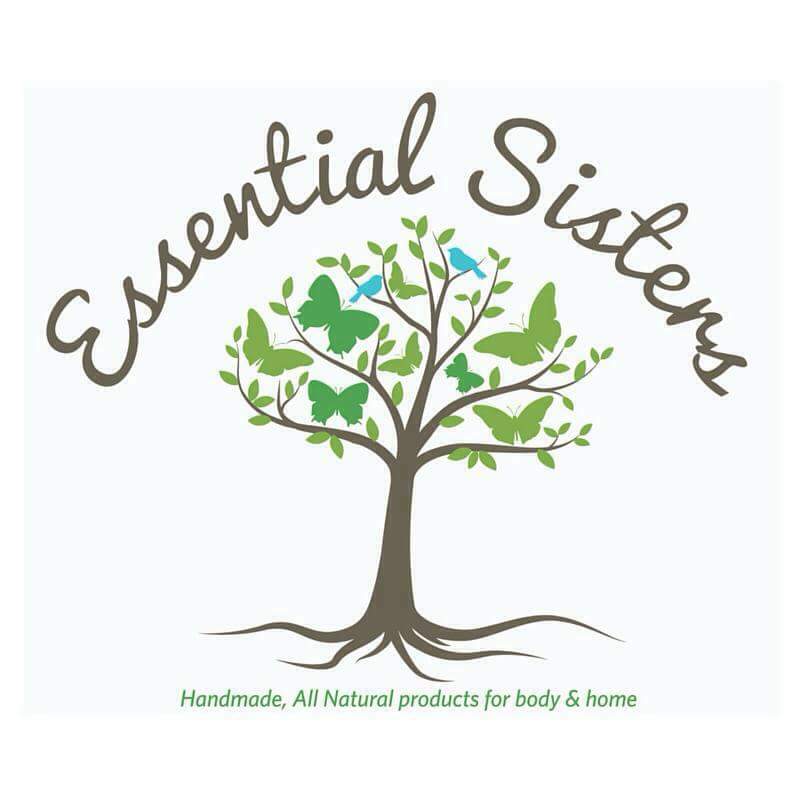 We have been working on something new and are finally ready to announce that Essential Sisters has added soap to our handcrafted natural products. We have been testing and tweaking recipes for about 18 months now and are happy with our results! At this time we are thrilled to say we have a Harvest Line, made mostly with things we have harvested from our own garden, fruit trees, herb beds and wild foraging. Our Limited Edition Apple Harvest 2017 soap is made with apples harvested, this year, from Gabi’s trees. Jeweled Plantain is made with wild foraged jewelweed and plantain from our parent’s back field. One of the best parts of this is we know where the ingredients have been grown and that no one has sprayed them with chemicals throughout the year. You will also find Garden Bisque, Silky Sunflower, Fruit Punch Salt Bar in the Harvest line right now. We have a Fresh Brewed Line too! Right now we have a Wake Me Up! Coffee Soap bar available, it compliments our Wake Me Up! scrub and Coffee lip balm- perfect set for a gift basket. We will be adding some beer and wine soaps to this line. For Father’s Day we gifted our Dad with “Drunken Hippy Soap”, look for this to be added in the future! If you have a special beer you would like to have used in a soap, contact us. Green Monster, Golden Honey Shampoo Bar, Tree Hugger & our Creamy Shea Soap are part of our Essentials Line. Our Green Monster is made with activated charcoal, chlorophyll, peppermint and eucalyptus essential oils. Golden Honey Shampoo is made with raw honey and has a hint of citrus. Some of our soaps are scented with essential oils, some are left unscented. The colors achieved in our soaps are done with natural ingredients. Herbs, spices and clays are great sources of color without chemical additives. You will always find all of the ingredients we use listed on the label. There are no parabens or phthalates in our soaps. As with all of our products, we use high quality ingredients from reliable sources. We do not use palm oil. We never test our products on animals. We work in small batches allowing us to closely monitor every step of the soaping process. This also means that many times when we make a soap it is in fairly limited quantity. We recommend storing your soap in a dry location. Using a soap dish in the shower/bath or at your sink can help keep soap dry and extend the life of the bar. If soap sits in water it continues to break down and won’t last as long. We have described a couple soaps throughout this but if you would like more info on any of these soaps and their ingredients, please comment below or message us, we are happy to help you! It’s been a while since we have done a giveaway…so we would like to give 2 bars of soap away! For one entry, Comment below with which Essential Sisters Soap you are looking forward to trying the most and then click on the Rafflecopter link below to be sure you are entered! Additional entries also available through Rafflecopter link below. Good luck! We will comment back here with the winner!! The Apple Harvest or the Fruit Punch Salt Bars!! They all look amazing!! The Wake Me Up!! Definitely something that this one needs for a rise and shine kind of morning. I’d like to try your Creamy Shea Soap. It sounds very pampering! Wake Me Up coffee soap hands down is the one I want to try the most. I am a coffee lover so this should be heaven. I’d love to try the Apple Harvest soap! Or the Creamy Soap! I’d love to try the Apple Harvest! Or the Creamy Shea soap! I would love to try the Tree Hugger or the Apple Harvest soaps. I would love to rty the Green Monster and Golden Honey Shampoo Bars. These sound wonderful! I am most excited to try the Luscious Lavender Goats Milk Soap. The wake me up sounds amazing! Thanks for the chance! I can decide between the Green Monster or the Silky Sunflower, both sound lovely. I would love the Apple Harvest 2017 flavor. I love lavender, and I think the Lavender Goat’s Milk bar would be amazing to try! THanks so much. I would like to try the coffee soap. That’s a first for me. I would like the Creamy Shea Soap. I would love to try the Limited Edition Apple Harvest 2017 soap. The soaps are all so pretty. The Apple Harvest soap sounds amazing! I would try luscious lavendar goats milk soap. Previous Summer is for herbal gardening. Next Top 5 Benefits of using an Essential Oil Diffuser.